At PQB Dental Clinic, we can utilize custom crafted crowns and bridges to restore the appearance and function of your smile. These tailored restorations are comprised of a tooth coloured material that is colour-matched to the exact shade and translucency of your natural tooth enamel. The process for receiving a dental crown will include taking digital x-rays of your smile to evaluate the tooth in detail and ensure no other treatment is required prior to starting the process. The tooth then will be shaped and prepared, after which we will take an impression of your tooth and model the crown from this mould. Once your crown is created we will fit the crown over your tooth and secure it in place with a permanent bonding solution. With good care it should last up to 10 years. A dental bridge is a suitable choice for patients who have suffered single or multiple tooth loss. This custom designed restoration is used to literally “bridge the gap” caused by tooth loss. 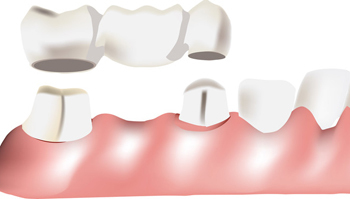 The process of receiving your dental bridge will generally consist of reshaping the anchor teeth so they are suitable for the dental crowns to sit over. Dr. Rogers will then take an impression of your smile and use this to create your bridge. Once complete we will then fit the bridge over your remaining teeth to fill the gap and make sure it is comfortable for you prior to cementing it into place.